Today´s card is inspired by a card I saw on Pintrest. 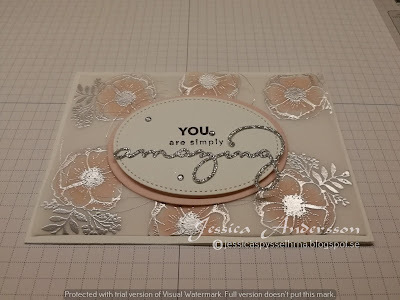 I am using the lovely free stamp set called Amazing you with the matching free thinlits called Celebrate you. I am using thick whisper white as base for my card. Then a layer of vellum. On the vellum I silver embossed the flowers and then coloured them with Powder Pink marker. 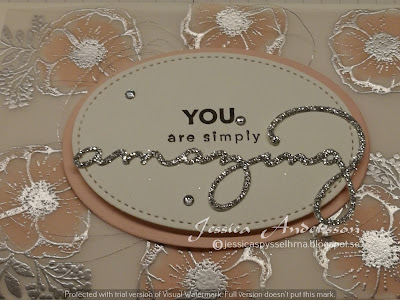 Cut out a oval circle in Powder Pink cardstock and then white cardstock with my stitched ovals. I also cut out the word amazing in Silver Glitter paper from the Celebrate you thinlits, but first I added the Silver Glitter paper to a piece of adhesive sheet so it was easier to add to my stitched oval. I then stamped the words in black ink. Added som rhinestones and som silver thread too. I hope you enjoyed the card! Have a great day!